I know you are loving the peeks at the brand-new September Sugar Pea Designs RELEASE?! This new stamp set, Bountiful Blessings, is adorable! It captures the fun and festive theme of the fall season perfectly...and super sweetly, I might add! It has several great sentiments and a couple of extra "prop" images to go along with the sweet "sweet-crow girl." Would you like to WIN the Bountiful Blessings stamp set?! Hop along and visit with the SugarPeas and guests, leaving some comment love along the way! One lucky person will be randomly selected to win the Bountiful Blessings stamp set! Our fabulous September release will be available in the SugarPea Designs Online Shoppe at 6:00 AM EST this Friday! Here's a peek at this sweet new stamp set!!! You're going to die when you see it! LOL! I stamped the main image over a piece of forest-like paper and colored here and there with pencils. The patchy pumpkin was also stamped onto paper and fussy cut. After a bit of layering and embellishing, this sweet card is ready to brighten someone's day this fall! Oh, oh, oh! 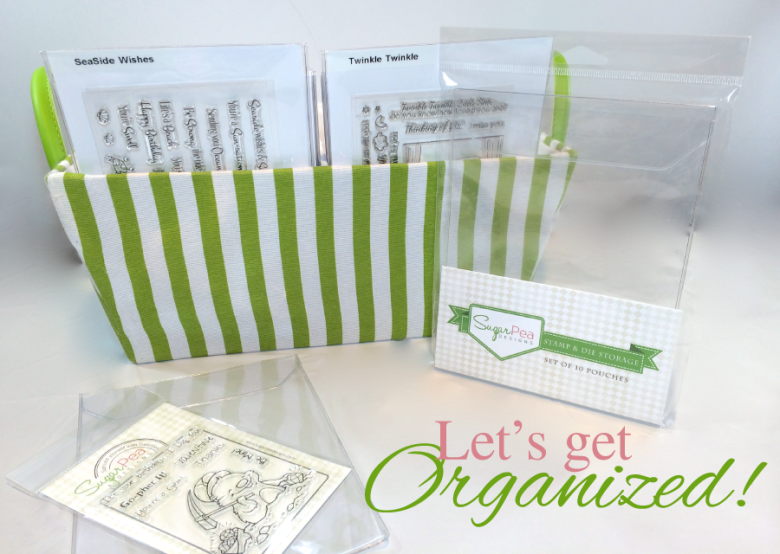 Have you seen the new SPD Stamp & Die Storage Pouches that are now available in the SugarPea Shoppe?! They are AWESOME! You can read all about these storage pouches HERE!!! Now, you are off to see what the Sugar Pea Designers created up using the new Bountiful Blessings stamp set today! I love that you didn't color in this adorable little scarecrow girl!! It shows those of us who aren't great at coloring that we can still make an adorable card with this wonderful stamp set!! Your card is cute! Thanks for sharing! The trees are a great addition and certainly changes the whole design. Nice inspiration! This is SO adorable!! As always, your paper choices are just brilliant!! what perfect paper to stamp her on, LOVE this Stacey! Adorable! Love that tree background paper and just the little touches of color on the image! Wonderful card. Love the papers and the fact that you left her and the pumpkin uncolored. Very cute and love the line image and popped up pumpkin. Cute card. I love the pumpkin popped up! Love your card. So cute. I love how the little girl is stamped without any coloring. It makes for an interesting card. Thanks for sharing a delightful card. Such a fun card - love the scarecrow and the patterned papers. So cute and great choice of papers. Cool background papers you used to stamp on!! So awesome and way to dress it up with great details like the sunshine, the sequins and that orange twine bow!! Looks terrific! Wonderful card, love your selective coloring. Thanks for sharing with us your ideas for using this stamp set. I love the composition of your card. I also like how you just stamped the girl and let the image be the star. Really nice. Oh my gosh, big smiles for your most adorable card!! Thanks for sharing. A fun card minimalistically (I actually used a 7-syllable word) colored card you've done. Love how that edge peeks out. Stacey: Brilliant card. I would never dare to stamp an outline image like this on PP. Your design adding areas of color complementing the scheme in the bold PP is fabulous. Cheers! Of course this is darling!!! Totally adorable set!! Thanks for the chance to win! My favorite image and I LOVE the colors that you used. So cute. She is so cute!!! Lovely card!